OSUFC began the season with high hopes. Finishing as the Regional Champions, the Region 3 overall points Leader, and National Finalists the previous season every player hopes to achieve just as much, if not more, than last season. 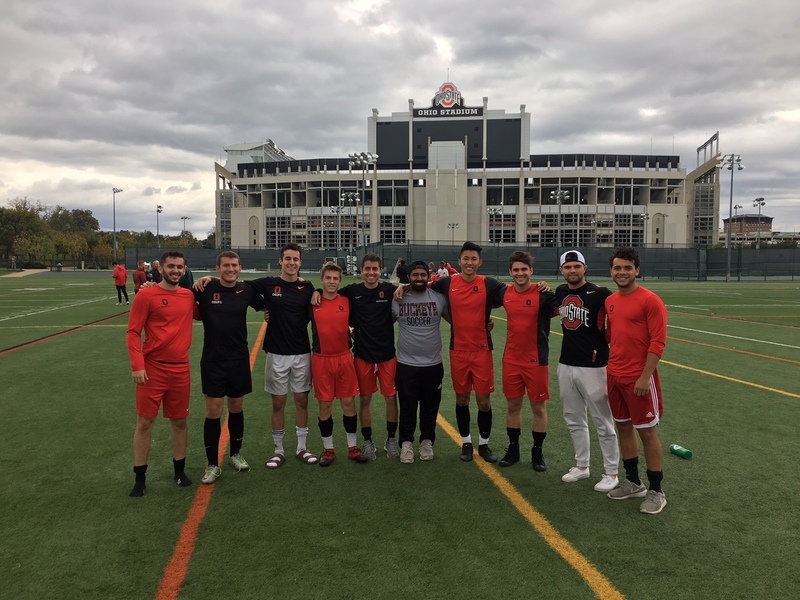 After an incredibly successful 2016 campaign, the Buckeyes entered tryouts looking to replace key players whom had graduated from the program such as Mike McKune, Niko Popovich, TJ Schuster, Joe Villari, Craig Zahour, and Ross DiDonna. The 2017 30 man squad consists of 19 returners and 11 newcomers. Team coaches Jon Bowman, Alex “Juice” Highley, and goalkeeper coach Alex Haas, added Nathan Cotton, former team captain of the 2014 National Championship team, to the coaching staff. The team consists of 13 seniors, 6 juniors, 7 sophomores, and 4 freshmen. The team executive board is made up of Thomas Gullo (President), Niko Strickler (Vice-President), Sam Agranoff (Fundraising Chair), Commodore Williams (Social Chair), Nathan Zanzig (Treasurer), Tyler Allen (Media Director), Alex Eikenberry (Co-Risk Manager), and Nate Meizlish (Co-Risk Manager). The Bucks finished the regular season with an 8-1-1 record finishing with 80 NIRSA Power Points, matching the amount garnered in last year’s regular season. The team’s 9-1 win over Kent State University marks the largest margin of victory during the season so far. A 1-0 road win over Ohio University and the club’s first victory (1-0) over Miami University since 2014 also cap off the regular season’s most notable games. Only conceding 9 goals in 10 games, goalkeepers Tyler Allen, Zach Arefi, Sam Frohman, and Will Gallucci combined for 6 shutouts. With 38 goals for, OSUFC scored more goals than any other team in the Region with the exception of Illinois – Orange who scored 47 goals in the MASC West. The team’s top 3 leading scorers at this point in the season are Andrew Chiou (4), Stefan Scheele (4), and Shin Nagahama (4). 17 different players have scored on the season. The 8-1-1 finish was good enough to secure a second place finish in the MASC-East right behind division rival Cincinnati, as well as a number 2 seed in the MASC Regional Tournament. For the first time, the MASC Becknell Cup will feature 16 teams, 4 from each division. Also advancing out of the East division with OSUFC is Cincinnati, Miami, and Wright State. The club has been drawn into B with University of Illinois – Blue, Purdue University, and University of Wisconsin – Platteville. The tournament will take place in the Grand Park Events Center in Westfield, Indiana from October 28th-29th. On October 28th OSUFC will play UW – Plattville at 10 AM and then Purdue University at 4 PM. Depending on the results of those games, the team hopes to be competing on Championship Sunday to have the chance to defend the Regional Championship title. If OSUFC were to win Regionals this weekend, the club would travel to Phoenix, Arizona to compete at the NIRSA National Championships where we would look to improve upon the 2016 season by becoming National Champions.